The new SLK, shown, takes styling cues from the CLS sedan and the SLS AMG coupe. 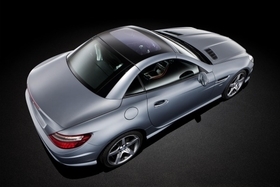 Mercedes-Benz unveiled its third-generation SLK roadster with a new optional panoramic glass roof and greener engines. The roof has a feature Mercedes calls “magic sky control” that switches from light to dark. It retracts into the trunk, turning the two-door into a convertible. The car comes standard with a retractable metal roof. A dark tinted glass roof without the light/dark feature is also available as an option. 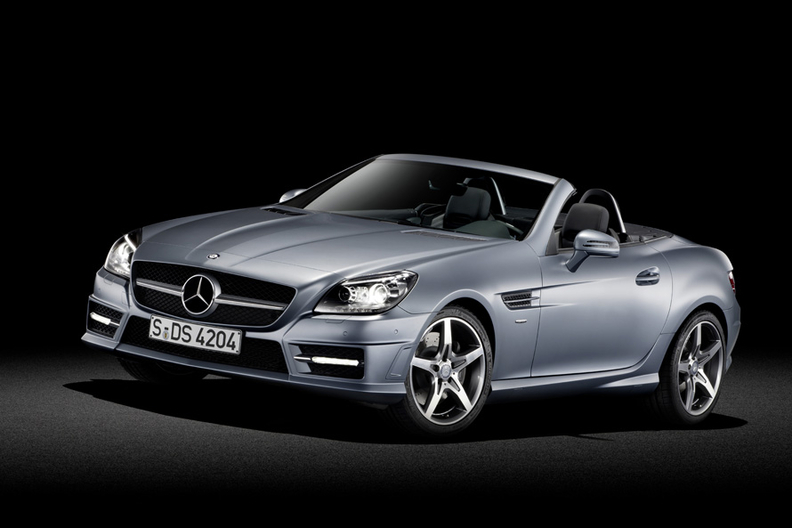 The SLK will go on sale in Germany on Jan. 17 with prices starting at 38,675 euros. U.S. sales begin in in the summer. In Europe, there will initially be three SLK models, all of them powered by new engines with direct injection and fuel-saving stop-start technology as standard. Mercedes said the SLK 200 BlueEFFICIENCY, powered by a four-cylinder 184-hp, 1.8-liter gasoline engine is the most economical roadster in its segment. With an optional seven-speed automatic transmission it uses 6.1 liters of fuel per 100 km and has CO2 emissions of 142g/km. Mercedes expects its new SLK to continue as a "cult" roadster. The SLK first debuted in 1996.